To Make the Herb Oil: Warm 2 cups of olive oil to about 100 degrees F. Add 1 cup of chopped fresh herbs or 1/3 cup dried herbs. Add the salt, pepper, and garlic. Stir together and allow to steep while you prepare the dough. You can keep any leftover herb oil in the refrigerator for up to 2 weeks (it makes a fabulous dipping oil!). Stir together the flour, salt, and yeast in a large mixing bowl. Add the oil and water and mix on low speed with the paddle attachment until all the ingredients form a wet, sticky ball. Switch to the dough hook and mix on medium speed for 5 to 7 minutes, or as long as it takes to create a smooth, sticky dough. The dough should clear the sides of the bowl but stick to the bottom of the bowl. You may need to add additional flour to firm up the dough enough to clear the sides of the bowl, but the dough should still be quite soft and sticky. Sprinkle enough flour on the counter to make a bed about 6 inches square. Using a scraper or spatula dippedi n water, transfer the sticky dough to the bed of flour and dust liberally with flour, patting the dough into a rectangle. Wait 5 minutes for the dough to relax. Coat your hands with flour and stretch the dough from each end to twice its size. Fold it, letter style, over itself to return it to a rectangular shape. Mist the top of the dough with spray oil, again dust with flour, and loosely cover with plastic wrap. Let rest for 30 minutes. Stretch and fold the dough again; mist with spray oil, dust with flour, and cover. After 30 minutes, repeat this one more time. Allow the covered dough to ferment on the counter for 1 hour. It should swell but not necessarily double in size. Line a 17 by 12-inch sheet pan with baking parchment and drizzle ¼ olive oil over the paper, and spread it with y our hands or a brush to cover the surface. Lightly oil your hands and, using a plastic or metal pastry scraper, lift the dough off teh counter and transfer it to the sheet pan, maintaining the rectangular shape as much as possible. Spoon half of the herb oil over the dough. Use your fingertips to dimple the dough and spread it to fill the pan simultaneously. Do not use the flat of your hands - only the fingertips - to avoid tearing or ripping the dough. Try to keep the thickness as uniform as possible across the surface. Dimpling allows you to degas only part of the dough while preserving gas in the non-dimpled sections. If the dough becomes too springy, let it rest for about 15 minutes and then continue dimpling. Don't worry if you are unable to fill the pan 100 perfect, especially the corners. As the dough relaxes and proofs, it will spread out naturally. Use more herb oil as needed to ensure that the entire surface is coated with oil. Loosely cover the pan with plastic wrap. Refrigerate the dough overnight (or for up to 3 days). Remove the pan from the refrigerator 3 hours before baking. Drizzle additional herb oil over the surface and dimple it in. This should allow you to fill the pan completely with the dough to a thickness of about ½-inch. Cover the pan with plastic and proof the dough at room temperature for 3 hours, or until the dough doubles in size, rising to a thickness of nearly 1 inch. Place the pan in the oven. Lower the oven setting to 450 degrees F and bake for 10 minutes. Rotate the pan 180 degrees and continue baking the focaccia for 5 to 10 minutes, or until it begins to turn a light golden brown. The internal temperature of the dough should register above 200 degrees F (measured in the center). Remove the pan from the oven and immediately transfer the focaccia out of the pan onto a cooling rack. 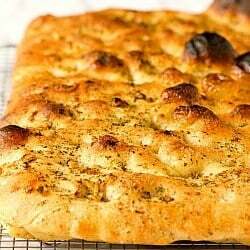 Allow the focaccia to cool for at least 20 minutes before slicing or serving.